Harrogate Gymnastics Club host parties! Our parties include one whole hour of exclusive use of our facility and we have party packages which include food to help make the special day stress free for grown ups. 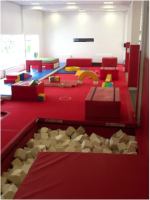 Our trained coaches will organise, amuse, supervise and instruct the children on all the apparatus including; trampoline, air track, foam pit, bars, beam and lots lots more. We love to hear from your child about what they would like to do at their party to make it a special day they’ll remember forever.